Our thermographers are licensed and certified at various levels 1, 2, and 3. Some hold Infrared Building Sciences Certification from FLIR while others hold BPI certification. Thus our thermography testing has emerged as a powerful, versatile, and highly accurate diagnostic tool for uncovering a wide range of problems in building systems and structures, including moisture intrusion, missing or damaged insulation, overloaded circuits, faulty wiring, loose electrical connections, construction defects, and post-fire damage. Remember you are looking at emitted energy in the infrared photo’s and not visible light. Many times you will find your insurance company hiring an independent company to inspect your insurance loss. Some of those companies are starting to use thermal imaging to determine the cause, extent and validity of the claim. In the insurance business you must have a sudden and unexpected occurrence that is not due to lack of preventative maintenance. REMEMBER…….The company inspecting your claim works for the insurance company and does not have your best interest at heart. Thermal imaging is a non destructive way to examine areas to determine the cause, and extent of the fault. Since the insurance company is documenting the claim to protect them from frivolous or no covered events, don’t you think it would be in your best interest to hire Thermal Imaging Consultants to document your loss just incase you and your insurance company do not agree about the extent of the loss or if the loss is even covered. 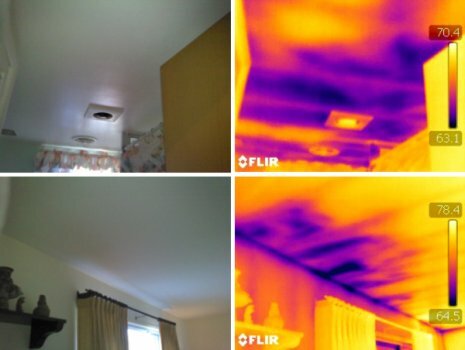 We have available to us certified thermographers with professional grade cameras that produce professional results that will document your loss. If in fact you feel that there is going to be litigation then we have on staff certified Professional Engineers, PE’s that can raise the investigation to a level that will be documentable in court. In addition to certified thermal imaging technicians, professional engineers, we have home inspectors that are HERS, BPI, Building Sciences, Federal Residential Energy Auditor, Residential Builder’s License and too many more to name here. Depending what your requirements are from basic thermal survey to documenting evidence to be presented in court. We have the resource to pair up to your needs. Other than our credentials and or reputation in the community, we do not sell any other services. You can rest assured that the report we provide is not exaggerated or influenced in any way as to profit from your situation further. 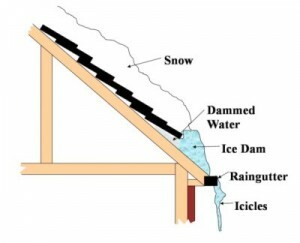 The Ice damming is caused by inadequate insulation. To prevent an ice dam, don’t heat the roof, keep it cold. That way, the snow on the roof eventually dissipates without making large amounts of melt water. The underside of the roof deck should not exceed 30 F.
The best way to maintain low temperatures is by ensuring that there is adequate insulation and sealing gaps that let warm air pass into the attic from the house. The attic must also be ventilated, so that cold air is introduced into it and heated air escapes rapidly. Loose-fill or batt insulation is typically installed in an attic. Although installation costs may vary, loose fill insulation is usually less expensive to install than batt insulation. When installed properly, loose-fill insulation also usually provides better coverage. One of the tell-tail signs of a potential problem is when icicles form from your gutters. The ice is now firmly in place and any melting snow is now flowing right over the gutter. The melting is fine as it flows over the gutter, but when the flow backs up is when it can come through the house. When your roof gets repaired one day in the future, make sure there is a drip edge and sufficient roof flashing is installed to prevent water penetration. 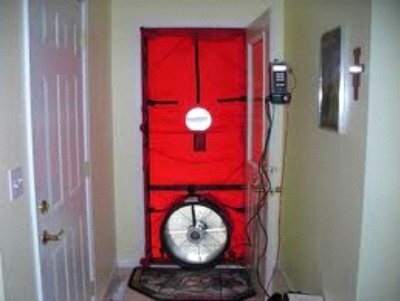 Blower Door Testing – Do I Need It? I have been asked on too many occasions if I provide blower door testing….When I inquire on why the question was presented the most common response is that other people provide that service so I will get more from them if in fact you do not provide that service? Blower door testing has been around as long as there have been fans and barometers. It is a technology that when compared to infrared thermal inspection is “Stone Age” in its technology and results. It does however provide one quantity evaluation that thermal imaging does not provide. A coefficient….. Yes that one almighty number that has a range between 0 and 1 usually represented in a decimal of .1, .2, and .3. .4 you get the picture. First of all why they do it. In the old days as well as today the only way to quantitatively evaluate the air tight effectiveness of a building envelope as far as tightness is by the blower door. This is because when you use a blower door you have an absolute set of parameters that in a lab or on the same building can be duplicated with precision accuracy. This is very important in evaluating the effectiveness of changes or modifications made of the building envelope. The changes in this coefficient will reflect the tightening of the building envelope to reduce the number of air turns it has per period of time. So in other words, if you are going to make changes to a building the only way to quantify and evaluate the effectiveness of those changes is to have a blower door test before and after the changes are made. Also read the small print with energy rebates they most often require a blower door test pre and post rebate qualified improvements. Here is the magic of how it works. The inspector places a false door made up of canvass covering an opening of an existing door. He then closes all openings to the exterior including but not limited to doors, windows, flues, dampers…..to make the envelope as tight as possible. Then the blower is started up moving the air from the inside of the home to the outside through the air tight blower door. The fan is calibrated so that the Revolutions per minute of the fan are directly equated to cubic feet of air passing by the blower door. When an arbitrary bench mark is met on a pressure differential between outside and inside by a barometer that is inside the home that has a static vent to the outside through a small plastic tube protruding through the blower door the magical number of 50 Pascal’s is met. This pressure differential can be measured in inches of mercury like our barometric pressure is published in the newspapers however this scale equates to the effect of a very small breeze of 20 MPH blowing on all sides of the home at one side. Yes that is impossible to replicate in terms of “Weather” and can only happen during a blower door test is in progress. At this moment the technician reads the cubic feet per minute at 20 Pascal’s differential and plots them on a chart based on the total volume of the home to determine the number of air exchanges per predetermined time the home is experiencing. Yes a significant amount of time is needed to measure the volume of the building envelope to determine the cubic flow per minute to the total volume of the home. So now we know the magic! The technician then goes to a table and come up with a coefficient of how well you home is sealed. Does it make a difference if you home is .8 or .4. Absolutely however what will you do with this information? If you are going to do extensive modifications to the building envelope for air intrusion then you will have a benchmark to evaluate how effective those intrusions have been resolved. HOWEVER……. If you are a home owner and have a blower door test as a by product of a normal energy audit please be aware of these facts. This number means nothing….. Because without a follow up blower door test you will never know if there is any improvement. You got something that no one else offered but don’t you think that time could be better spent on providing you with more information about reducing your energy costs? 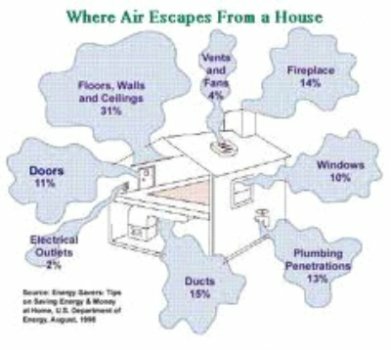 When your home is placed under the stress of a blower door you are creating an artificial vacuumed that you never experience naturally even under most all weather conditions. It is IMPOSSIBLE to have wind blowing on each side of your home at 20 MPH anywhere and at any time in any place at any time. What a blower door test does do is provide the inspector a target rich environment to simultaneously conduct a thermal imaging inspection. Here we are combining the old technology of the blower door with new technology of Thermal Imaging…How wonderful can that be? So here is the difference… if you have a expensive highly sensitive camera that is above the specification of an inspection camera, you do not need to have the extra stress of the vacuumed on the building envelope to expose the deficiencies. When you have a sensitive camera that can see them under normal circumstances, there is No Need for A Blower Door Test! If you are not trying to qualify for an energy rebate you do not need a blower door test. Further, having small tornados swirling from an electric socket, or switch plate does not represent normal behavior of the building environment but allow some opportunity for photographic hyperbolae to occur because of the barometric difference. Much to the homeowners disadvantage and much to the inspector’s glee especially when he is trying to sell you on fixing the deficiencies he has discovered.. So in conclusion, I am simply explaining to you today that when you have the latest technology in a thermal image camera, it produces a thermal image including accurate temperatures and displayed more thoroughly to a consumer what is truly happening in their home. Why pay for something extra when you can obtain the same results with fewer steps, and use the extra time to explain to the homeowner what is happening during your inspection. – you be the judge. I am glad that you have taken the time to allow me to explain the blower door test. I look forward to discussing any further questions you may have in regards to this issue. Feel free to call me anytime if you should have further questions.